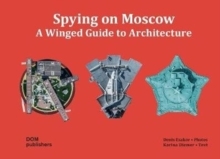 This collector's album presents Moscow's architectural icons. With photographic precision, Denis Esakov captures the fifth facade of the largest European metropolis: roofs, domes, and cube-like buildings stacked on top of each other. By gazing through the drone's eye, the artist fosters a novel visual aesthetic that opens up new vistas, even for Moscow connoisseurs.